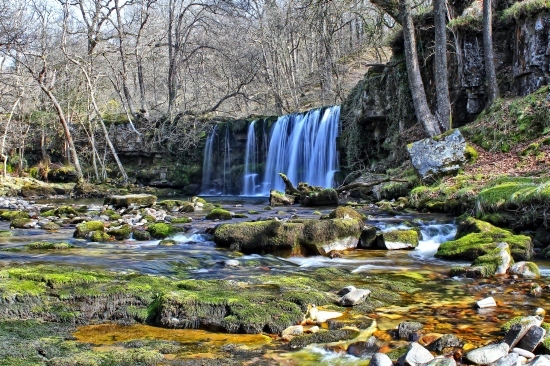 Once again we feature "Waterfall country in the vale of Neath". We are so fortunate to be living in the vale of Neath which offers outstanding natural beauty. These waterfalls have been photographed in all seasons, many of them have not been visited by some local resients. 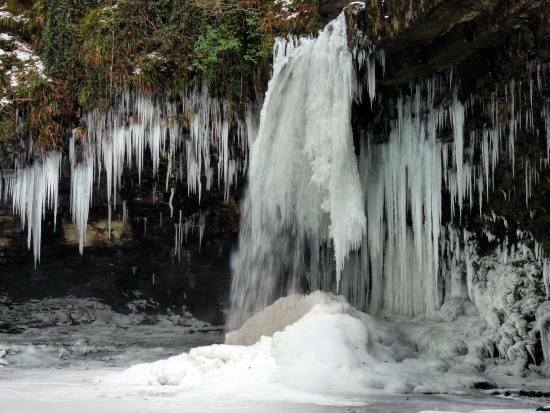 Even in the depths of winter when the falls are frozen it is a magical sight to behold. In South Wales, and the Vale of Neath in particular, the typical cause of waterfall formation is due to differential erosion of soft and hard rock strata found together in the river bed. Where historic movements in the earth's crust has caused faulting, or glacial erosion has exposed the softer underlying rock strata to the erosive forces of the river, it will cut more deeply and quickly into the softer rock creating a drop in the water level and, consequently, boosting the erosive power of the water. In the Vale of Neath we find extremely hard, erosion resistant rocks such a millstone grit and old red sandstone overlying bands of softer fissured carboniferous limestone and fossiliferous shales. When the water finds its way through the joints and along the bedding planes of the harder rock exposing the shales and limestone, the water soon begins to take its toll on the softer rocks and so depriving the harder rocks of support, causing them to collapse - see diagrams. Whilst in many cases this process causes the formation of waterfalls when the underlying rock is predominantly limestone, it is often possible for the whole river to disappear underground through enlarged fissures in the rock to form caverns. This process then leaves a dry river bed along its original course which in time becomes re-vegetated. The Nedd Fechan and Hepste both disappear for short stages, but the most dramatic example is where the River Mellte pours underground for nearly a quarter of a mile to form an extensive cave system just south of the village of Ystradfellte.